True stories of ordinary women achieving extraordinary things in rural Australia. The inspiring bestseller now with new material. Making your living from the land in Australia is not for the faint-hearted. Isolation, hard physical work, long hours and the vagaries of drought, floods and fire make it a challenging environment for any farmer. But how do you cope when you are a woman in what is traditionally a man's world? 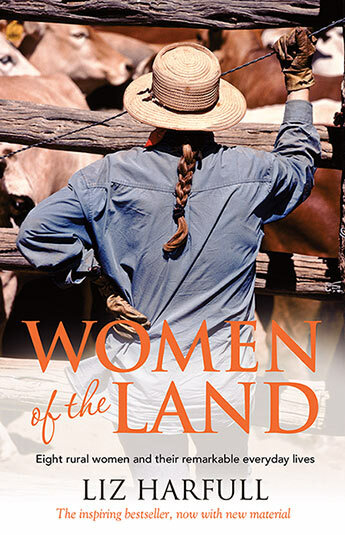 Women of the Land brings together the heart-warming stories of eight rural women spread across Australia who run their own farms, capturing their ways of life, their personal struggles and their remarkable achievements. Often juggling the demands of raising a family, they have overcome tragedy, personal fears, physical exhaustion and more than a little scepticism to build vibrant futures that sustain them and their families. Despite their diverse backgrounds, they all share several things in common - genuine humility, a passion for farming, and a deep, spiritual connection to the land which sustains them. This is the inspiring story of eight rural women and their remarkable everyday lives. Liz Harfull is passionate about telling the stories of regional Australia, its people, communities, history and traditions. An award-winning rural journalist and communicator, she grew up on a small farm near Mount Gambier, which has been in the family since the 1860s. In 2006 Liz walked away from corporate life, as a director of a leading national public relations agency, to write books. Her leap of faith was rewarded two years later with The Blue Ribbon Cookbook, which became a surprise best-seller. Capturing the stories and traditions of South Australian country shows and show cooks, it even took her to Paris where it won a Gourmand World Cookbook Award. Since then she has written two national best-sellers, Women of the Land and The Australian Blue Ribbon Cookbook, as well as Almost an Island: the Story of Robe, about her favourite season town on the windswept Limestone Coast. Today Liz lives in the Adelaide Hills, juggling a busy writing career with travelling Australia to visit the places and meet the people that inspire her writing.